I am in the process of upgrading my sewing machine (rubs hands in anticipation of delivery) and will launch my Etsy shop in August 2015. Yes, I bit the bullet. Over the past year I’ve been reluctant but after discussion with the owners of N’Genious Creations (@ngeneioustshirts) a Chicago based apparel company , it’s time that I expand. Although I do not have the bandwidth to take orders, hand made items can be purchased as they become available. I look forward to sharing with you soon. 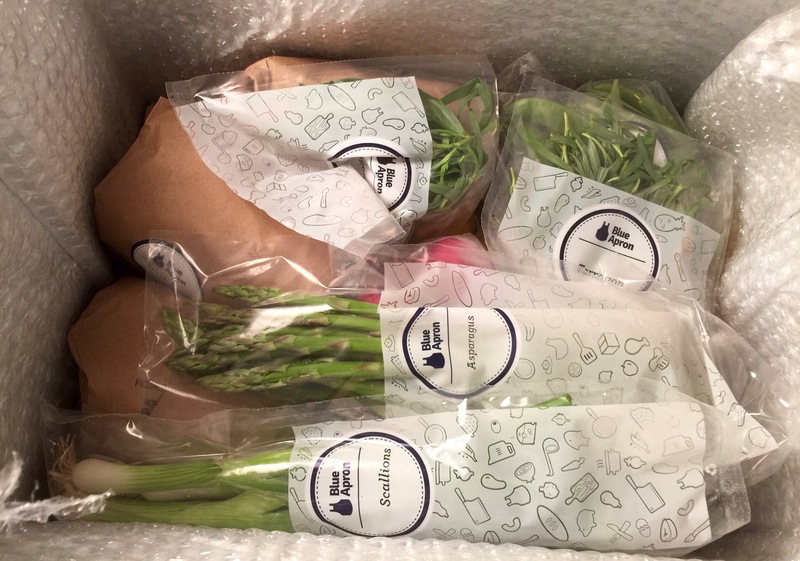 A few weeks ago, I asked if anyone experienced The Blue Apron. One friend’s son is a fan. After reading up on it, I decided to give it a try. Blue Apron, is one of the newer food service companies. Times have changed and so has home food service. 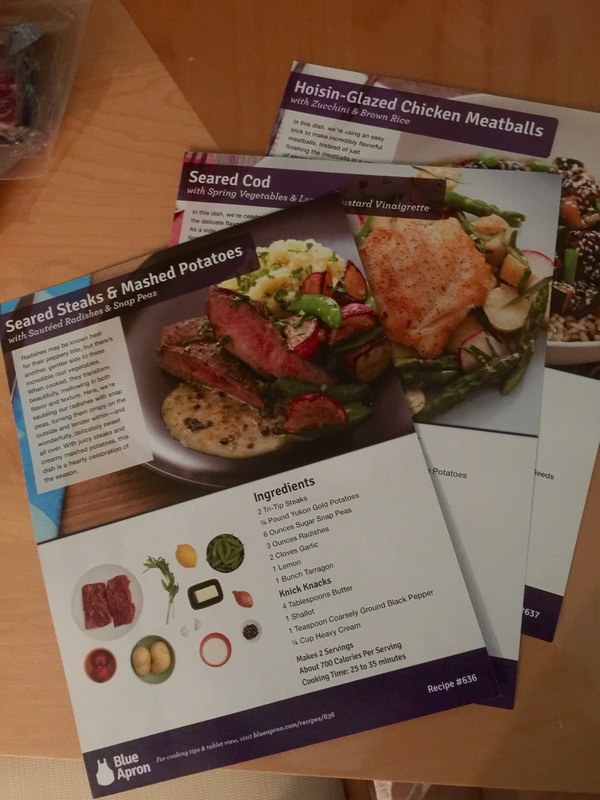 Blue Apron is a no-commitment service that provides customers with a preview of full dishes they can prepare themselves, full color recipe cards (letter size) with photos, decide when the shipment is to be delivered to your home, specify food preferences, when not to deliver and the per-person shipment based on your budget. There are no commitment fees. I drive an average of 152 miles a day, three times a week. By the tine I return home, I don’t want to think about a menu and I don’t want to see a grocery store. I’m tired. Also, I hate leftovers!! I have a tendency to cook as if my children are still living at home (and bake as if I have a tribe) therefore, on trash day, I am calculating in my head the cost of leftovers that we discard, and am disgusted. Well it’s just the King and I. He OWNS my kitchen so I started small: 3 meals a week for 2 people. How much? $59.95. Someone yelled “that’s not cost effective” when I told her but do the math. This is $10 a meal per person. So what if she feels this is too much. It’s the price I’m open to paying for convenience and a HEALTHY meal. Everything except pots and pans. Initially my eyes said “that’s all?” but that thought quickly dissolved. 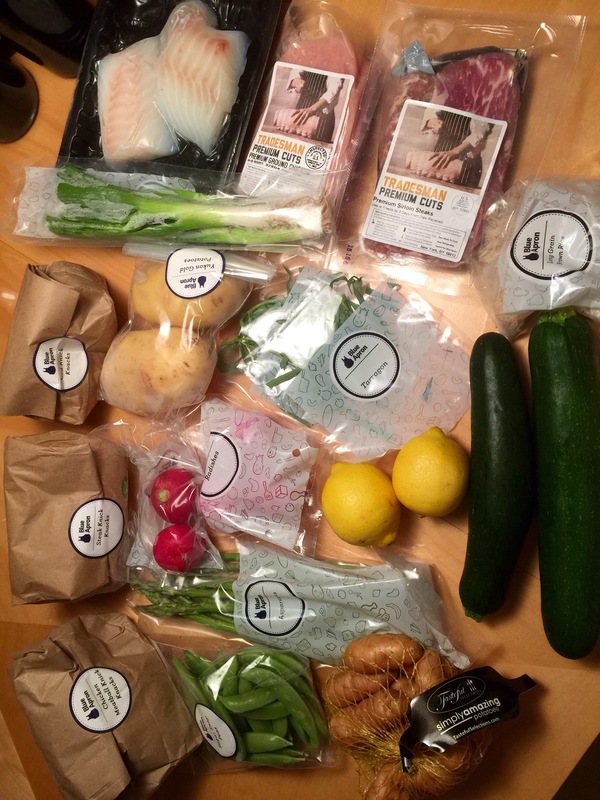 Blue Apron shipped precisely what I asked. Enough to meat for 2 people for 3 meals, all of the staples, veggies and seasoning. 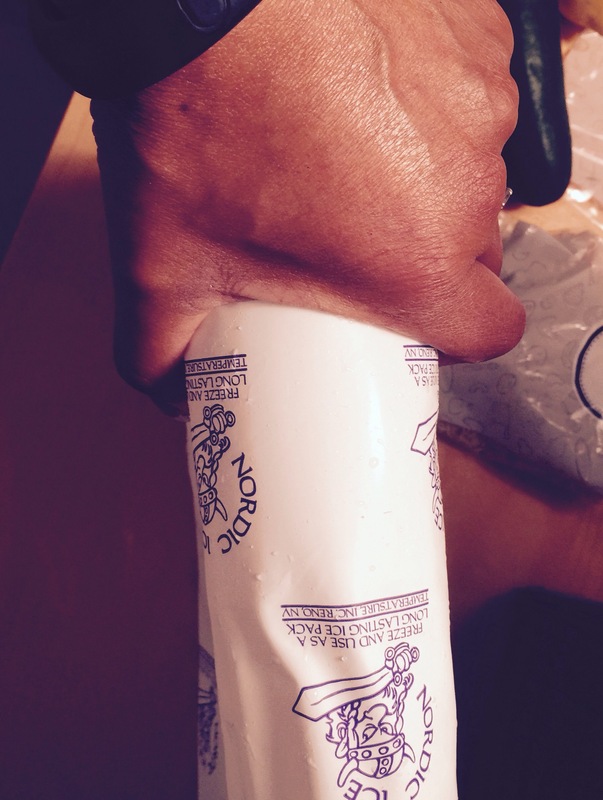 They even shipped heavy cream necessary for one recipe. The box is big enough for a bowling ball enclosed in styrofoam (just to give you a visual). 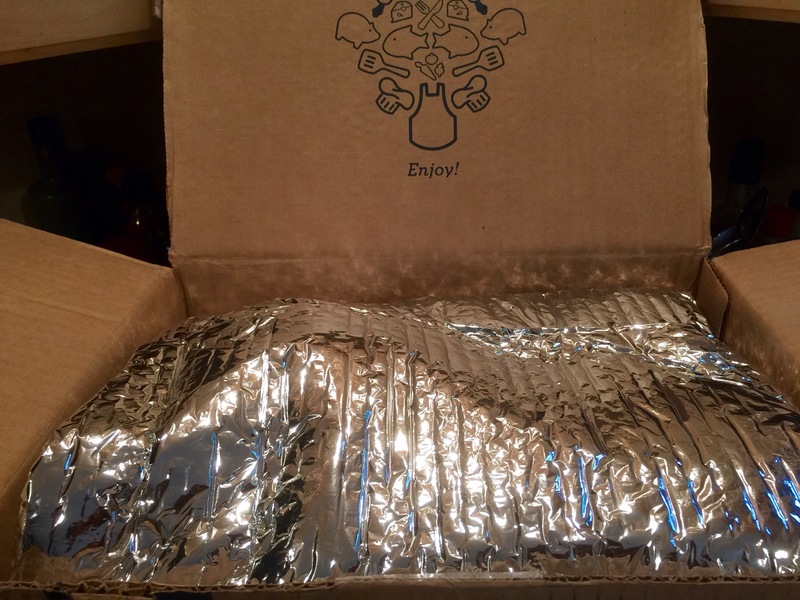 A 2″ thick Nordic-ice foodsafe block is on the floor of the box. 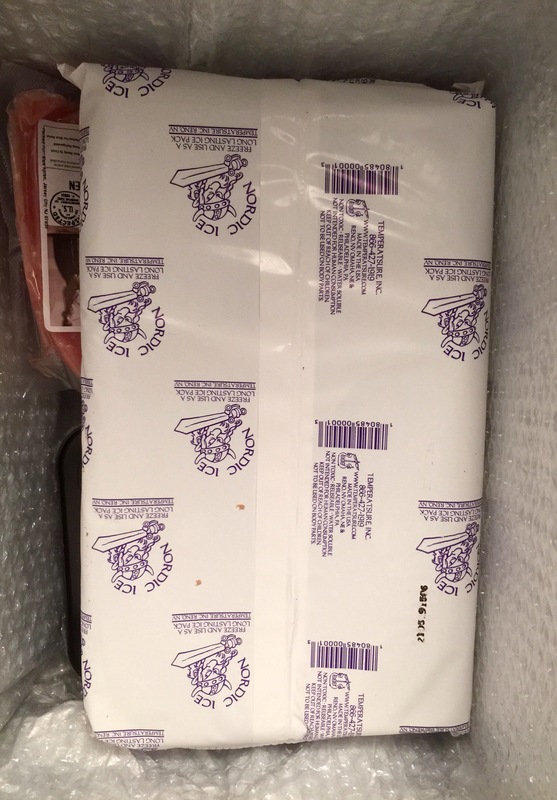 The meat lays over it and a second block lays on top. Then the staples, veggies, dairy (if any) and seasoning are on top. This is all contained in an insulated bag. The veggies and staples are individually wrapped in Blue Apron labeled bags and the seasoning and misc items are in a brown paper bag marked “knick knacks”. I put everything on the table looking for a reason to complain, but no complaints here! I was momentarily confused and mumbled “Where are the recipe cards?” Something told me to check the box. On the side of the insulated bag, I found a welcome letter and three recipe cards. Ok. That’s perfect except, the King already told me that he was cooking so, I put everything away. The following evening I got home from work and asked “what’s for dinner? Without looking up from his iPad, he mumbled “I dunno Miss Blue Apron, what’cha cooking?” I excitedly washed my hands and got to work relieved that he relinquished his spatula and sauté pan and let me have some space. The first dish selected was the red meat recipe above. Steak and mashed potatoes. When the King skimed the picture on card he mumbled “who serves potatoes with mashed potatoes?” I looked down and saw the picture and realize, it is radishes. I personally never ate a cooked radish and was rely tank to follow the recipe excluding them. 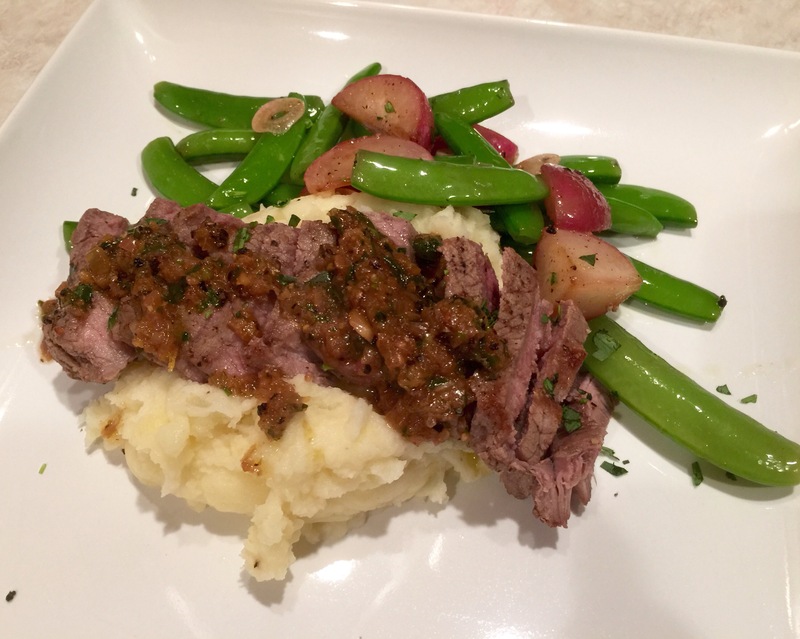 One of the reasons I wanted to try Blue Apron was to try cooking different, healthy and proper portion meals. Who knew how flavorful radishes sautéed in a little EVOO salt and pepper with snap peas would be so tasty!?!? Overall, I give this service a thumbs up! Tasty, good portions, easy to follow and healthy. 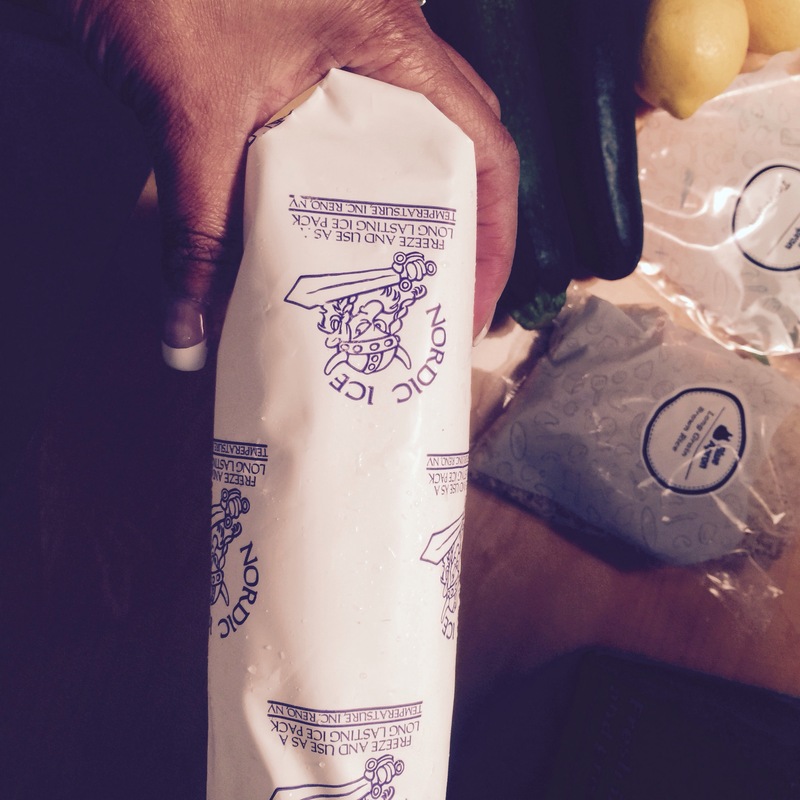 Try @blueapron today!